A player that goes by the name of ''TushTush33'' lodged a complaint at AskGamblers.com since the operator refused to pay him his winnings of $7,000. We've followed this complaint up with management, once we receive sufficient feedback we'll post it here. The player has been refunded. Your payment of $100 to Neteller has been settled. ”Players like to play in an environment that offers something tangible, Casino Fantasia knows exactly how to satisfy this need”. There’s a lot about Casino Fantasia that resonates well with me. The site has been online since 2014. To begin with the website of the operator looks good from a visual point of view that’s loosely segmented into slots, table games, bingo, mobile gaming, exclusive offers and video poker. An online casino’s ”Home Page” is an indication of what’s going on behind the scenes. It helps instill customer confidence, honesty and concern for player satisfaction. In terms of the aforementioned, Casino Fantasia ticked all the boxes. The operator is owned and operated by Oceanlink N.V Casinos a company licensed in Curacao. As a software provider, Novomatic needs little introduction. Initially it was used in the games in land-based casinos. Thanks in part to its crisp and innovative graphics it became an instant hit with players from the onset, as such it was just a matter of time before it found its way online. Although the instant play (Flash) casino game variety is not as extensive as that of NetEnt or Microgaming, one can clearly see that the developers focus more on quality as opposed to quantity. The mainstay of its gaming lineup is slots followed by a limited table game variety (roulette and blackjack) and video poker (Deuces Wild Jackpot). If you’re one of those players that follows the green-bill-road, I’m happy to inform you that Casino Fantasia offers you a once off bonus of 100% up to $250. Before you can qualify for the sign up bonus you must deposit a minimum of 10 credits-yes that’s all. To avoid any confusion going forward. Keep in mind that the bonus has a play-through requirement of 40 times that must be cleared first before a withdrawal can be made. Before the bonus can be triggered the following code must be provided first: FANTASIA100. The bonus can be used to play all slots machines except jackpot games. If you’re not sure how the bonus wagering works, here’s a quick example. Elisa deposits $100, provides the code (FANTASIA100), her account is instantly credited with an extra $100. She can now play with $200. She decides to play slot machines only (100% weighting). Before a cash out is permitted she must roll over 40x$100=$4,000. Casino Fantasia offers support round-the-clock, be it through email or live chat. At times the cyber-world can be a bit empty at times. No player wants to feel alone in an online casino. If something goes wrong, there’s comfort in believing that Help is just an email away. All queries are taken seriously and will be addressed in a timely manner. We’ve tested the casino’s email support and received a reply to our query within 6 hours. Without any further ado support is satisfactory. When you click on the ”Help Area” at the footer a comprehensive FAQ (Frequently Asked Questions) page opens up. It addresses common questions players normally ask on ”how to retrieve my password”, ”how to register an account”, deposit and withdrawal methods, security and so on. If you’re new to the world of web gambling I suggest you go through it before you sign up. Any casino game that’s based on luck or skill always poses an element of addiction. This is why Casino Fantasia offers players the usual responsible gambling tools such as deposit, maximum win/loss per day, session limits and a self-exclude option. It also lists the various countries’ problem gamblers helping sites. If you’re a problem gambler or you want to close your account at the casino, contact support and state the reasons as to why you want your account closed. Identity theft and credit card fraud is a lot in the news nowadays. Customers want casinos to protect their personal information they give in order to play and wager money. They also don’t want their name put on some mailing list to be sold to sales marketers, who will bombard them with unsolicited emails and cold calls. Casino Fantasia guarantees the sanctity of all aspects of player privacy since it wants to retain its customers. Your private details is protected by encryption software also known as ‘Secure Socket Layer’ or SSL. Although the operator does not post the findings of its audit reports on its website, its games are deemed fair since Novomatic is a reputable land-casino vendor as well. In summary. 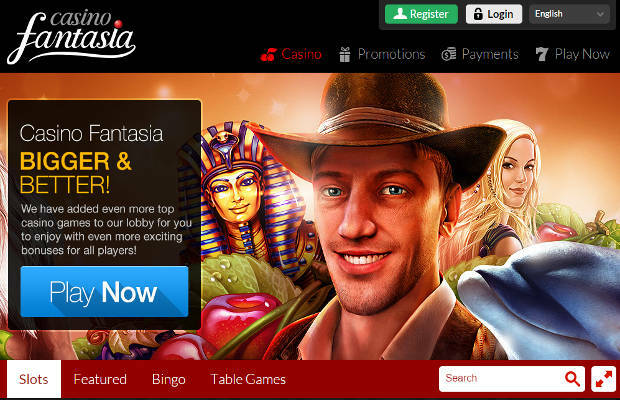 Casino Fantasia is a relatively new comer to the world of internet gambling and not a major player yet at this stage. Although it lacks the usual bells and whistles of some of the bigger operators, its customer support has been exemplary to date. A trait that has not gone unnoticed and guaranteed to take it to the next level. Unfortunately it does not offer much in terms of special promotions, a large game variety and the wagering of its sign up bonus borders on the steep side. Otherwise recommended. Wagering requirement is 40xbonus before a cashout can be made. Can be used to play slots, casino games except jackpot games. Regretably it does not offer other promotions aside from the proverbial sign up and reload bonuses. I’d like to see extended promotional offers such as free spins, comp points on selected games and a VIP program. If the operator can manage this it will be a great site for players to play. Players can fund their accounts with one of the following deposit and withdrawal methods: AstroPay Card, Bank Wire Transfer, MasterCard, Neteller, Paysafe Card, Przelewy24, Sofortuberwaisung, Boleto, Todito Cash, Skrill, Visa, GiroPay, Safetypay Online Bank Transfer, Ukash. If you request a withdrawal via an ewallet (Neteller or Skrill) it will be cleared within 24 to 48 hours, maybe sooner. Credit/debit card payments can take anything from 3 to 5 days and bank transfers 3 to 7 days. The maximum monthly deposit amount is $50,000. The max. withdrawal limit depends on the deposit method used. The minimum withdrawal amount is 20 credits.Once you’ve requested a withdrawal you must provide the following documents: A valid copy of your passport or driver’s license (picture included), a utility bill and bank statement that’s not older than three months. The following currencies are accepted: American Dollars, Euros, Brazilian reals, Colombian pesos, Mexican pesos, Polish zlotys and Peruvian nuevos soles. Casino Fantasia’s Novomatic casino game library consists only of 50 games. The majority are slots machines followed by table (roulette and blackjack), bingo and video poker game. I’ve read player comments stating that it’s refreshing to see another vendor such as Novomatic since it offers something different in the game department. The only downside to an other great software provider is the oh so limited game variety. Progressive jackpots other than Deuces Wild is virtually non existent. As mentioned previously the game variety is slots centric. Games that steal the show are the Book of Ra, Sizzling Hot, Dolphin Pearl, Chicago, Lucky Lady Charm, Rumble in the Jungle and many more. These games offer free spins, high-end graphics, they are high variance too but if you’re lucky they offer spectacular payouts. In a real-world casino, players can physically observe the dealer shuffle the cards and watch the roulette ball bouncing on a roulette wheel. In a cyber-casino, they must trust the casino’s computer software. Trust that is monitored and operated pursuant to standards of random chance and fairness. Although Casino Fantasia does not list the average payout nor the company which audited its software on its website. Its stands to reason that it operates within these standards. Then again the licensing jurisdiction (Curacao) may impose certain standards and require compliance with regard to a certain type and testing of the gaming software. Presently the average payout percentage for all its games is 95.67%. Unfortunately I can’t corroborate this figure with a legitimate audit report.